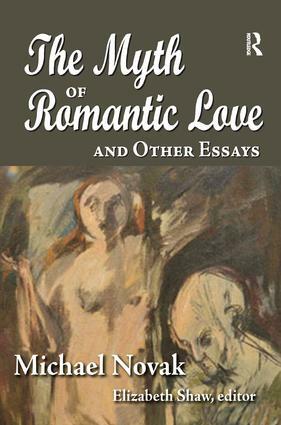 Written by noted Catholic philosopher Michael Novak, the selections in The Myth of Romantic Love and Other Essays highlight the arc of his intellectual career. Collectively demonstrating the fundamental unity of Novak's work, the sixteen essays in this book span a broad range of political, economic, and social topics.The selections offer clarity of thinking for the sake of concrete ends. For example, The Myth of Romantic Love, the chapter from which the title of this work is drawn, sharply distinguishes the love that popular culture portrays from the true Christian vision of love. And The Family out of Favor argues, if things go well with the family, life is worth living; when the family falters, life falls apart. Thus, true Christian love manifest in marriage and family life is a greater resource for civilized society than any other institution.Although this collection shows that Novak's viewpoints did evolve over time, he remains a thinker that is clearly rooted in the ancient and medieval Catholic tradition. From his discussions of gender relations, to economics, culture, and politics, his perspective honors the primacy of man and his immediate experience, and thereby ultimately glorifies the Creator. Novak's writing will infuriate some readers, and inspire many others—but both comrades-in-arms and intellectual opponents will find the clarity and intensity of his writings undeniable.